Save an extra 5% when you book online. Use promo code ONLINE5. Destin Cottage. Half Price Special. BAREFOOT BEACHHOUSE in Maravilla. Half-Price in April. $129 per night. Automatic discount when you book online or call us at 423.899.3003 for friendly personal service. You'll love Barefoot Beachhouse. A spacious vacation cottage in Maravilla Community. Roomy enough for up to 9 people to stay. Great for one large family, 2 families or 3 couples in this comfortable vacation home. Everyone can vacation together at the beach with plenty of room to spare! Free Beach Setups (2 Chairs and Umbrella). Book online or call us at 423.899.3003 today! $99 per night in April. Book now! Relax in this Spacious and Delightfully Decorated condo. Sleeps 6 with 2 Bedrooms and 2 full Baths. Pet friendly, featuring all tile floors, comfy Queen Bed in master, 2 Twins in separate bedroom. Sleeper Sofa. Short walk to the beach. FREE beach service (2 chairs and umbrella). Steps to the gated pool. Call us at 423.899.3003 or Book online today! POOLSIDE PARADISE. Half Price Special. Pet friendly! Maravilla 2111. Book online or call. Come stay at our "Poolside Paradise." One Bedroom. 2 Baths. Comfy King Bed. Hallway Bunks. Ground Floor Convenience. Steps to Pool. Short walk to the beach! Free Beach Service (2 Chairs + Umbrella). Pet Friendly for Small Dogs! Call us 24/7 at 423-899-3003 or Book Online now! SAVE 50%. Springtime Deal. Only $112 per night. 3-nights min. Instant Book Online! Better Book Now! 2 bedroom, 2 bath condo with ocean view and ground floor convenience. Steps to the Beach. Totally renovated Spring 2019. Close to the Pool. FREE Beach Setups. (2 Chairs + Umbrella) Small dog pet friendly. Take advantage of this limited time offer. Be the first to book online now! STUNNING OCEAN VIEW. Half Price Special. Pet Friendly! Maravilla 2305. Book now! $124 per night. Book April now! Stunning beachfront view from Living Room and Master Bedroom. 2 bedroom, 2 full bath condo with awesome ocean view. Small dog pet friendly. 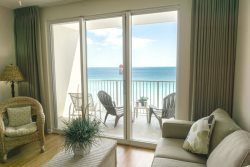 You'll enjoy a Destin stay at popular Maravilla. Free umbrella and 2 chairs set up for you. Call us at 423.899.3003 or Book online now! A special 5% discount to our guests who book online. We are always here to help you by phone and by chat during business hours. When you book online right here on our website, we are happy to discount your stay 5%, just use promo code ONLINE5 when you book your stay online. If you like specials and discounts on your vacation stays, sign-up for our email list. Well send you an email occasionally with specials and discounts as they are added to the website. You will be the first to know.